If you've ever come across slot developer Playtech's money-themed Mr. Cash Back slot, you'll know there are certain games that do pretty much what they say on the tin: it's a slot, it has 'cash' in the title, you can win cash…..er, that's it. Las Vegas-based Bally Technologies are definitely in that camp, as is evident by their sun 'n' sea-themed 5 reel, 40 payline slot, Cash Wave. 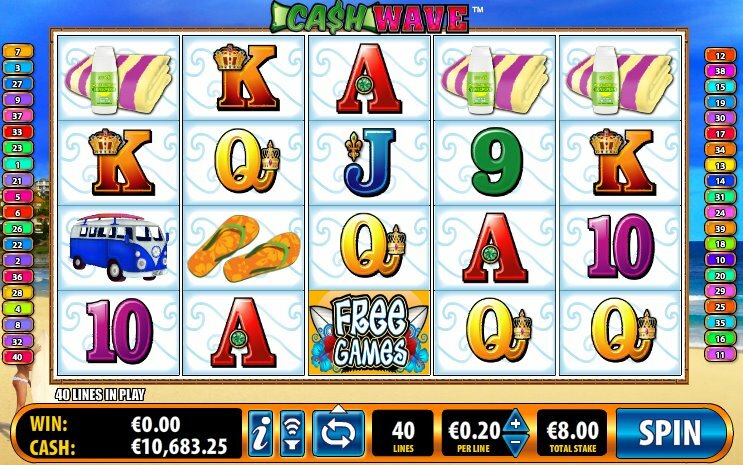 The 'wave' here is one you'll find surfin' at the beach, but play your slots right and you could be overcome by a wave of cash. Bally like to put at least one beauty in their slots, and there's a smiling Californian belle who smiles at you throughout. There's little music or FX to speak of, other than the familiar 'one-armed bandit' sound effect from its live cousin, and the standard 'win' music you normally see in Bally slots. On the reels, there are plenty of signs of the summer: flip-flops, sun cream and towels, the 9-through-Ace symbols, a VW camper for a trip to the beach, and of course our beaming blonde. The 'Wild' logo acts as the Wild, and substitutes for any symbol except the Free Games symbol. 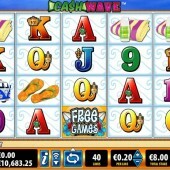 That Free Game logo is scattered and when hit on reels 2, 3 or 4 it will trigger, funnily enough, the Free Games Bonus game. 5 free games are awarded where reel 5 is all Wild in the first game, reels 4 and 5 all Wild for the second free game, and so on. During the bonus feature one or more Stacked Wild in a winning combo is Wild and substitutes for all the symbols. In terms of summer fun, there are plenty of other slots to get you in the summer mood: Microgaming's holiday-packed Surf Safari, with its 243 ways to win action, and the celebrated progressive jackpots and bright graphics of Playtech's summer-filled Beach Life. As for Cash Wave, while there's some summer salvation in a Wild-heavy bonus game, where's the surfboard, the chiseled dude, the surf guitar washing over the soundtrack? Sort it out, Bally!